Enjoy more good-time learning with CD and text sets that sequentially teach scientific information to fun, toe-tapping melodies of long ago. 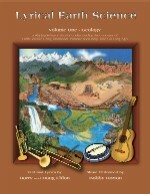 Lyrical Earth Science is similar in style and design to the award-winning Lyrical Life Science series with over 200 line drawings in approximately 100 pages written and produced by the same authors and musician. Melodies include: Shenandoah, The Boll Weevil, Sousa's Washington Post March, Handel's Water Music, My Grandfather's Clock, Wabash Cannonball and more. to the tune of "Anchors Away"
With crystals large, or crystals small, or with crystals not at all. Information is more advanced than in Lyrical Life Science so it is recommended for 5th through 10th grades. Takes a fresh look at this unique natural resource. You will find out why ice floats when most frozen substances sink and how water rises in the trunks of trees, working against the pull of gravity. ROARING WATERS, THUNDERING EARTH and WHIRLING WINDS are infinitely complex natural phenomena. They are also the titles of the 3 DVDs included in this Moody Science package. 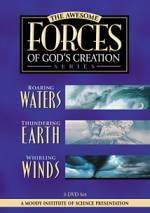 Now you can see the powerful effects that these forces generate, such as floods, volcanoes, hurricanes and more, captured in this exceptional 3-DVD series.